What are your country’s summer traditions? Summer in Japan is very 蒸し暑い (“muggy” / hot and humid). Florida, where I grew up, is also hot and humid during the summer. But, unlike Japan, I don’t recall any particular traditions of summer in Florida…other than going to the beach or water-slide parks. Japanese people like to celebrate the uniqueness of the seasons of the year. There are traditions in autumn, winter, spring and summer in Japan. ● Summer festivals and fireworks shows. Japan has 祭り (festivals) all year round…but there’s an abundance of them in the summer. And in late July to early August, there are many excellent 花火大会 (fireworks shows). Click here to see my listing of summer festivals in the Tokyo area. This is a Japanese summertime tradition that is similar to Mexico’s piñata. 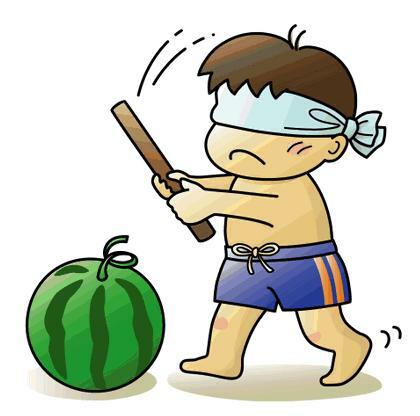 In both traditions, people take turns being blindfolded and try to hit the target with a stick, but in Mexico, the target is a kind of paper doll filled with candy that gets hit until it breaks open, Japan’s スイカ割り (“Watermelon smashing”) has a watermelon as the target. Once the watermelon gets hit and breaks open, everyone enjoys eating it. 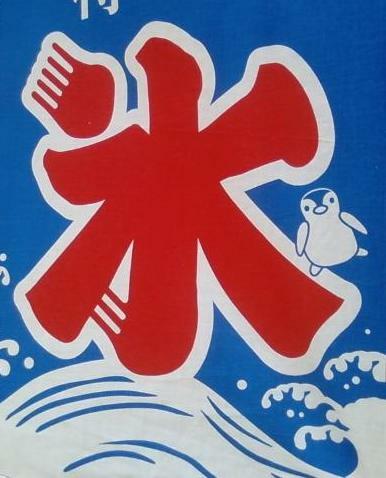 Eating eel is believed to give stamina to survive the grueling summer heat. Click here to read a post that I wrote about it. Every summer the 蝉 (cicadas) can be heard chirping in Japan. It’s considered one of the sounds of summer. I wrote this post about the cicada in Japan. Eating shaved ice with a sweet syrup flavoring is a popular way to people to stay cool in the summer in Japan. In the summertime, many places in Japan offer space to drink beer outdoors (and often on the building’s roof) in the cool night breeze. Some places offer an “all-you-drink” (within a time limit) special. Of course, swimming is popular in the summertime in Japan just as it is in Florida. Pools and beaches in Japan have lifeguards on duty and very few are open year-round. Most of them are opening around now. Toshimaen, an excellent amusement park / waterslide park / pool in Tokyo opened on weekends only beginning July 2nd this year and will be open everyday from July 16th until September 4th. What types of traditions does your country have in the summer? Suntory Beer has a new beer in Japan. It’s called 「絹の贅沢」 (literally: “Luxurious Silk“). Embarrassing name for a beer and a generic-looking can design…but it was on sale so I bought half-a-case. This is Suntory “All Free”. Non-alcoholic beer. Non-alcoholic beer—none for me, thanks. Do you like beer? 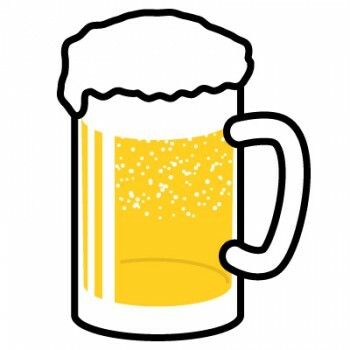 What do you think of “non-alcoholic” beer? I just got a case of Kirin Beer’s latest beer*. 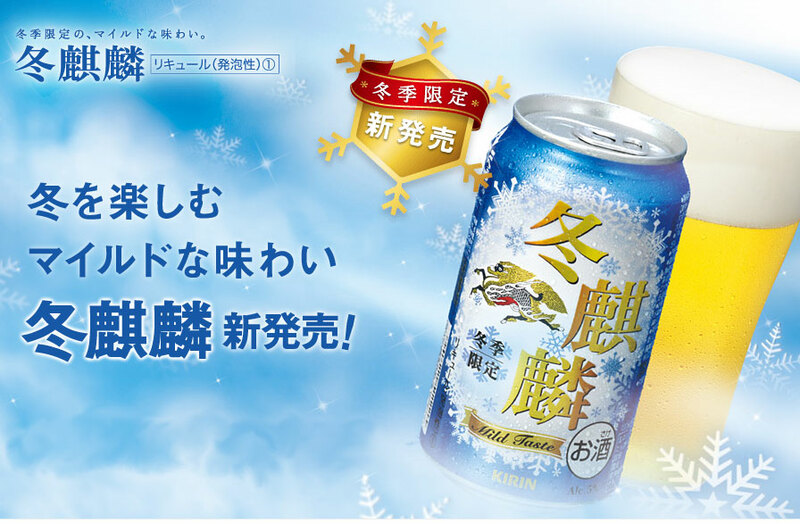 This new beer is called 「冬麒麟」 (“Winter Kirin“). It tastes very good. It has a “mild taste” just as it says in the ad. This is a temporary beer offered by Kirin Beer for this winter season, so if you’re in Japan, I recommend trying a can or two. In Japan most of the major beer brewers offer “seasonal” beers ever year. Special beers in specially designed cans of spring, summer, autumn and winter. It’s just a gimmick to help sell beer, of course. But I don’t mind, I usually like to try them when they come out with a new one every year. 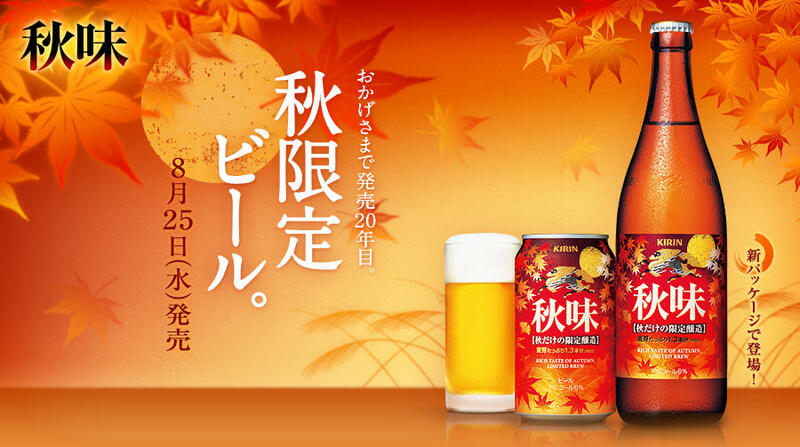 On August 25th, Kirin Beer began selling 「秋味」 ビール (“Autumn Flavor” beer). As I mentioned in a post last year, Suntory Beer sold their autumn beer (called 「秋生」 (“Autumn Draft”)) on that same date last year (2009 August 25). The design of the Kirin and Suntory beer cans look quite similar. Do beer brewers in your country offer seasonal beers like this? Are they popular? In Japan, especially during the summer, 「ビアガーデン」 (“beer gardens”) are popular. 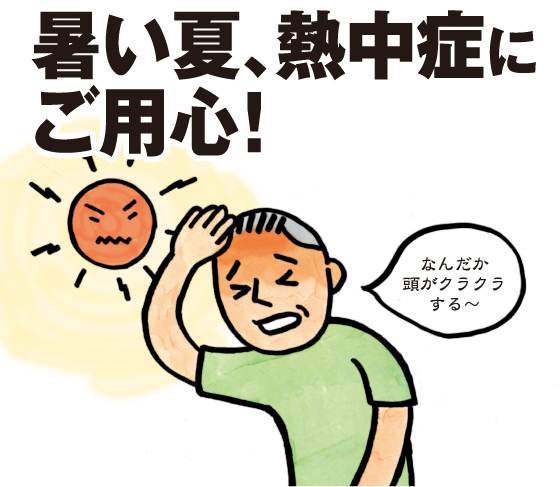 Many places, such as the Tokyo Dome, Roppongi Hills, etc., have beer gardens only during the summer months. And many beer gardens in Japan are on the rooftops on restaurants. Beer gardens in Japan are simply an outdoor venue to drink beer and eat food with friends in the evening summer breeze. A great way to cool off and enjoy summer. The “Let’s Enjoy Tokyo” website has launched a “Beer Garden” website that shows information about most of the beer gardens in the Tokyo area this summer. It’s in Japanese only…but click here to see the Beer Garden website. I wrote an earlier post about Sapporo Beer‘s new “Ice Lager Beer“ for this summer. 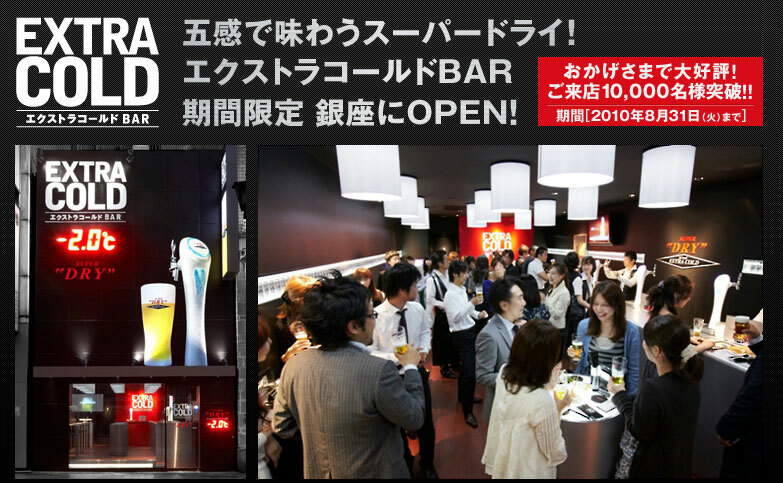 Well, Asahi Beer has a new bar in Tokyo called the 「エクストラ・コールド BAR」 (“Extra Cold Bar“). This bar is in Tokyo’s 銀座 (Ginza) area and will only be there until 2010 August 31. In this bar, the beer is served extremely cold…between 0°C and -2°C. Even the beer taps are freezing cold and covered in ice. 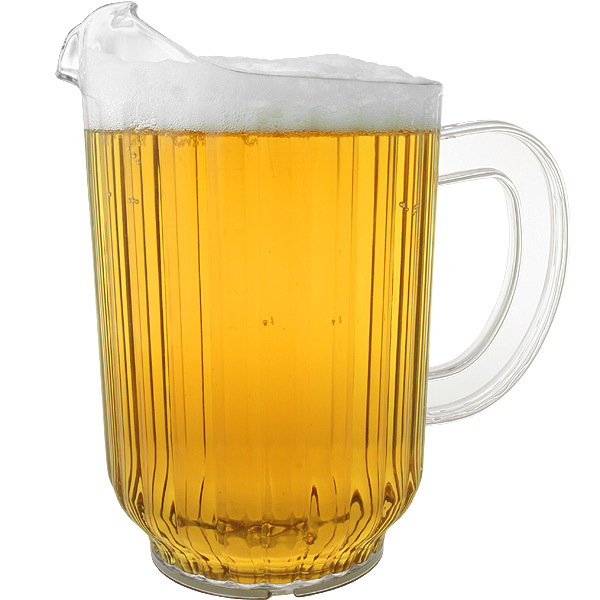 Customers are welcome to pour their own beer from the icy taps if they want to. If you’re in Tokyo before August 31 and you want to go to the “Asahi Extra Cold Bar”, it’s near JR 有楽町駅 (JR Yurakucho Station) or the 銀座一丁目駅 (Ginza 1-Chome Subway Station). (Last order is a half-hour before closing). Today I bought a case of a new “limited edition for 2010” beer by Sapporo Breweries. It’s called 「サッポロアイスラガー」 (“Sapporo Ice Lager“). I couldn't resist a "ice" lager beer with polar bears on the can...it gives an image of being a real cold beer---perfect now that the weather is so hot! Technically it’s not a “beer”, per se…but a 「発泡酒」 (low-malt beer). Actually I prefer 発泡酒 (low-malt beer) because it tastes the same as beer but it’s cheaper in Japan because it doesn’t have the high beer tax added to it’s price. So, beer or 発泡酒 (low-malt beer)…I enjoy drinking both but I usually buy 発泡酒 (low-malt beer) because of the price difference. Anyways, I knew about this 「サッポロアイスラガー」 (“Sapporo Ice Lager“) beer before I bought it because of the funny TV commercial with two polar bears complaining about the heat and looking for something cold to drink.